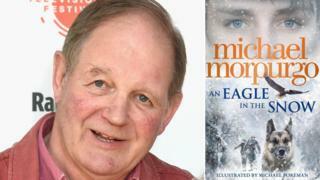 War Horse author Michael Morpurgo has won the Children's Book Award for a record fourth time. His novel An Eagle in the Snow, illustrated by Michael Foreman, is inspired by the true story of one man who might have stopped World War II. The annual book prize is chosen and voted for entirely by children. The former children's laureate last won the prize in 2011 for Shadow, the story of boy who is befriended by an army sniffer dog in Afghanistan. Kensuke's Kingdom and Private Peaceful also won the prize in 2000 and 2004 respectively. An Eagle in the Snow begins in 1940, when a boy called Barney and his mother find themselves on a train forced to shelter in a tunnel during an air raid. In the darkness, a stranger on the train tells them a story of Billy Byron, a hero of WWI who had the chance to kill Adolf Hitler. "Michael Morpurgo has demonstrated once again that he is a truly magical storyteller," said Jane Etheridge, chair of the Federation of Children's Book Groups, the charity which runs the award. Morpurgo and Foreman's novel was picked as the overall winner from the winners of three age categories. One, by Sarah Crossan, won the older readers category and Oi Dog!, written by Kes and Claire Gray and illustrated by Jim Field, won for younger children. The Children's Book Award, formerly known as the Red House Children's Book Award, was established in 1980. Previous winners include JK Rowling, Patrick Ness, Malorie Blackman and Anthony Horowitz.